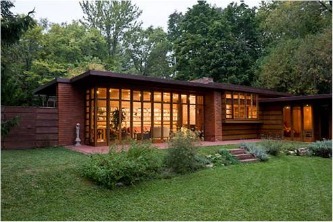 Referring to his work as ‘usonian’ (the character of the American landscape as distinct and free of previous architectural conventions) Wright’s early designs were small single story buildings. These compact structures commonly featured flat roofs, clerestory glass windows, ceiling to floor glass walls, under floor heating and large cantilevered overhangs that provided solar heating and natural cooling. Such principles revealed that Wright was an early adopter of the ideals behind self sufficiency and although it wasn’t at the heart of his work, it may be argued that he was one of the first to embrace of energy efficient construction methods. 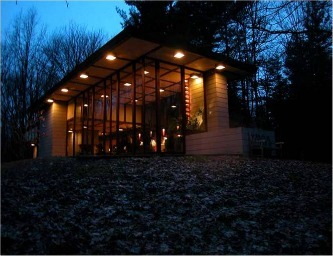 The Jacobs 1 house in Madison, Wisconsin is regarded to be the first example of the architect’s work. Built in 1937 Jacobs 1 was constructed by Wright after one of his acquaintances challenged him to design a family home within a $5000 budget (the equivalent of $86000 today). Wright duly obliged, creating a functional L shaped property that featured external and internal ceiling to floor glass windows throughout. Wright used glass generously to keep the building costs down and ensure that the interior had a spacious feel that belied the buildings actual size. Following the creation of the impressive but modest Jacobs 1, Wright spent the ensuing years creating bespoke homes for friends, and others taken by his architectural style. As his designs became larger and more ambitious his appetite for using glass as a building material became even greater. 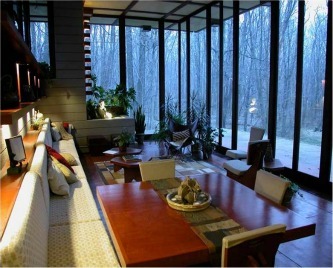 Louis Penfield House located in Willoughby Hills, Ohio, is a fine example of Wright’s deployment of glass as a building material and proves that when used properly glass can reduce the distinction between indoors and out. The remote location of Louis Penfield House allowed for Wright to open the building up to the elements and he did so by creating a large square glass room on the right hand side of the building that features floor to ceiling glass windows. The house is one of the most unique of Wright’s designs and people can now visit the house and spend the night there. 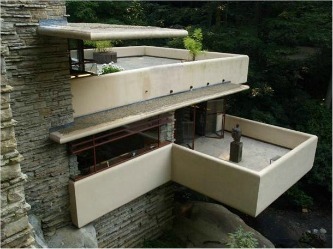 The most famous example of Wright’s work is Falling Water in Pennsylvania. This building was designated an American national historic landmark and chosen in 1991 by the American Institute of Architects as the ‘best all time work of American architecture’. Built directly above a waterfall the building is strongly integrated with its natural surroundings and helps create a strong bond between man and nature. One of the most notable features of the building is the lack of steel window frames. Wright opted instead to install large glass windows directly into a caulked recess in the stonework in order to make the stone walls appear untouched by the glazing and retain a natural look. Wright’s style retains an influence over contemporary architecture and now many homes and commercial properties employ glass to create a heightened feeling of space and connect the outdoors with the in. Here at Pilkington we provide unique solutions for a wide variety of projects that use glass as a core building material in the way that Wright pioneered. On the Pilkington website there are a number of case studies that show some of the more recent glass building projects that we have been involved in, click through this link here to read about some of our most recent projects.